A recent study conducted by the Brigham and Women’s Hospital and the Massachusetts Institute of Technology have discovered that a large majority of some of the most frequently prescribed medications in the U.S. contain at least one “inactive ingredient” that could cause adverse reactions. Inactive ingredients are added to medications to improve taste, absorption, shelf life and a variety of other characteristics of a pill. The study team found that over 90 percent of all oral medications they tested contained an ingredient which can lead to gastrointestinal symptoms and other allergic reactions in sensitive people. The inactive ingredients include peanut oil, lactose, chemical dyes and gluten. These added ingredients present a challenge to clinicians who want to make sure they are prescribing a medication that does not cause an allergic or adverse reaction. The study actually was inspired by a real life situation where an individual with celiac disease was prescribed a medication that contained gluten. The team collaborated with a biochemical data scientist and an internal medicine resident and others to analyze data of inactive ingredients found in 42,052 oral medications all of which contained more than 354,597 inactive ingredients. 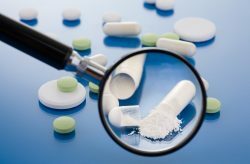 Inactive ingredients are defined as any substance that is added to a pill’s formulation but are not expected or intended to have any direct therapeutic or biological effect. Inactive ingredients have been tested for safety at population levels. However, scattered case reports have shown that inactive ingredients can cause problems for individuals with intolerances and allergies. The team notes that the data set is complex. There are hundreds of different versions of capsules or pills that deliver the exact same medication but use a different combination of inactive ingredients. This indicates how convoluted the choices of inactive ingredients is. But it also suggests that there is an untapped opportunity to specifically choose the most appropriate version of a medication for someone with unusual sensitivities. The research team discovered a total of 38 inactive ingredients that have been described in literature to cause adverse symptoms after oral exposure. At least 92.8 percent of medications analyzed contained at least one of these ingredients. About 45% contained lactose, about 33% contained a food dye, and about .08% contained peanut oil. While the content of a particular inactive ingredient may be too low to lead to an adverse reaction in most people, someone with an allergy or intolerance could have a reaction. These doses may be low, however it isn’t known what the threshold is for individuals to react to them. This pushes scientists to think about precision care and the role of legislation and regulation when it comes to medication labels that contain an inactive ingredient that can cause adverse reactions.